This shawl has a lovely wide border knitted sideways with a lace panel, twisted stitches and tiny bobbles for textural interest. 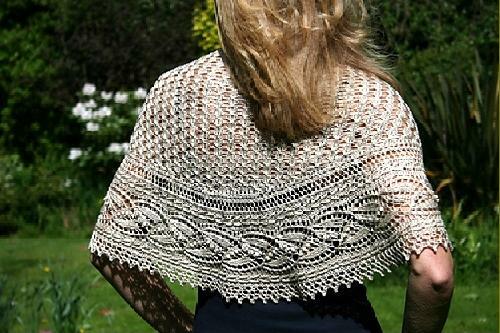 The body of the shawl is worked in a textured lace pattern from the bottom up using short rows to give it a crescent shape. For intermediate or advanced knitters. Instructions included to easily adapt different yarn weights. Size 7 or 8 circular needle suggested.